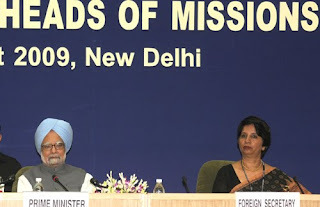 AS MANY as 112 top Indian diplomats heading Indian high commissions and embassies across the world, gave a patience hearing to Prime Minister Dr Manmohan Singh who spelt out his expectation from the country’s top diplomats while addressing at the conference of Indian Heads of Missions on Tuesday. The three-day-long conference, organized by the ministry of external affairs (MEA) in New Delhi, began on Monday. Prime Minister wanted the diplomats to link India’s foreign policy with domestic policies particularly economic policy, and stressed that the country’s foreign policy should be aimed at addressing the challenges of mass poverty, ignorance and disease in the country, which were the primary concern of the Indian state and polity. So what should Indian diplomats do for the country now? Prime Minister identified three pillars of our global engagement -sustaining capital inflows to supplement domestic investment efforts, the need to take advantage of rapid scientific and technological developments in the world, and the need to ensure that the country’s growth is not constrained by scarcity of natural resources, an MEA release said. Read, "Doc’s prescription: Manmohan Singh asks PMO officials to think creatively" posted on June 12, 2009. Also read, "Dr Manmohan Singh’s prescription for IAS", posted on May 30, 2009. Action & Appointments: Padamvir Singh is new LBSNAA director a) Padamvir Singh, a 1977 batch IAS of Madhya Pradesh cadre, and currently special director, Lal Bahadur Shastri National Academy of Administration (LBSNAA) has been elevated as director of the academy in the rank and pay of additional secretary to the government of India. For those not so familiar with India’s civil servants and their training programmes, Mussoorie-based LBSNAA is the apex training institution in the country for senior members of the civil services. Mr Singh, who had earlier served as deputy secretary and director in department of personnel and training (DoPT) during the early 1990s, is known to be an expert of India’s public policy and administration. A graduate in economics, Mr Singh attended a 17 weeks long special program on urban affairs in an US university in 1992. b) N Gokulram, a 1974 batch Karnataka cadre IAS, and presently secretary in the department of animal husbandry, dairying and fisheries under the ministry of agriculture, has been attached with the Cabinet Secretariat as Officer on Special Duty (OSD) in the rank and pay of a secretary. c) Rudhra Gangadharan, a 1975 batch Kerala cadre IAS and currently director, LBSNAA has been appointed as secretary in the department of animal husbandry, dairying and fisheries in place of N Gokulram. d) Dr Ashok Kumar Amrohi, presently ambassador of India in Algeria, has been appointed as the next high commissioner of India to Mozambique in succession to Rajinder Bhagat. CVC launches prosecution against 22 officers Central Vigilance Commission launched prosecution against 22 officers out of which seven were from Central Board of Direct Taxes (CBDT) & ministry of home affairs (MHA). The Commission also advised initiations of major penalty proceedings against 135 officers of which 31 were from public sector banks, 29 from ministry of railways, 13 from MCD, 7 each from DDA, CBDT & FCI. Recoveries to the tune of Rs 90 lakh were effected after Commission conducted technical examination of some departments.